The author of the article referenced below, Nicole Levine, is an associate professor of infectious disease at the University of Florida. This means she teaches the MSU below to many others. In other words, she’s an MSU “carrier”. 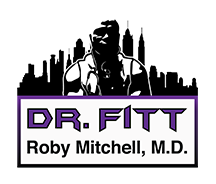 As an “expert” in infectious disease, she states in the article that flu viruses cause damage to lung tissue that can then lead to pneumonia. VIRUSES DON’T PRODUCE A TOXIN AND THEY DON’T HAVE TEETH! Viruses are totally incapable of causing ANY damage to human tissues! What causes all the symptoms ascribed to the viruses is your immune system response to millions of viral particles being released after one virus enters a human cell and uses the DNA to make millions of copies. The two-pronged attack by the immune system consists of “cellular” and “humoral” moieties. The cellular attack is similar to the battle scenes in movies like Saving Private Ryan. The difference being that in the case of viruses, the enemy is unarmed. The cellular attack is marshaled by macrophages (monocytes) and T lymphocytes. The humoral attack is similar to an Air Force dropping bombs. The “bombs” of the immune system are chemicals called “cytokines”. It’s these cytokines that cause all the symptoms of the flu, including death. If there is a compromise in the ability of your ground troops (macrophages and T lymphocytes) to directly engage the enemy, your sole defense becomes producing cytokines. Like bombs, cytokines are indiscriminate and can destroy unintended targets, like lung tissue. Mercury is used as a preservative in vaccines. There are a multitude of scientific articles explaining how toxic mercury is to various human systems. The screen shot is from one giving the effects of mercury on the immune system. “Apoptosis” means cell death. 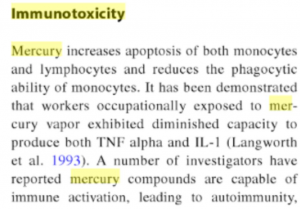 MERCURY KILLS YOUR MACROPHAGES AND T LYMPHOCYTES! This why pregnant women are frequently warned about fish consumption. It’s why there are no more mercury thermometers. MERCURY IS HIGHLY TOXIC! “Phagocytosis” is the Pac Man like activity that gives macrophages (macro= big. Phage= eat) their nomenclature. Macrophages normally gobble up critters and the digests them into critter bits (antigens) with a chemical called lysozyme. These antigens are then regurgitated and presented like “wanted” posters to other immune cells called “B cells”. B cells produce antibodies in response to these antigens. Sooooo, what happens when you get the flu vaccine is that your immune system gets weakened. This makes you vulnerable to other viruses that are present 24/7/365. The flu shot does cause you to get the flu. The Trojan vaccine this year was particularly dangerous because it opened the door for the H3N2 virus. The proteins on the H3N2 cause a more aggressive immune system response. This was such a deadly flu season because of the immune system compromise caused by the vaccine combined with the predominance of a more virulent strain of influenza causing a “cytokine storm”. Your best shot against the flu and other viruses is the Intelligent Design system that has allowed man to survive viruses for millennia when no vaccines existed. “However, only about half of all eligible people get the flu shot. Two misconceptions contribute to low vaccination rates: that the vaccine causes influenza and that the vaccine doesn’t work.